*NO COUPLES OR BACKPACKERS** Absolute beachfront! Listen to the waves while you fall asleep. Large room for rent with fantastic ocean views and double size built in wardrobe. Own bathroom with large shower. 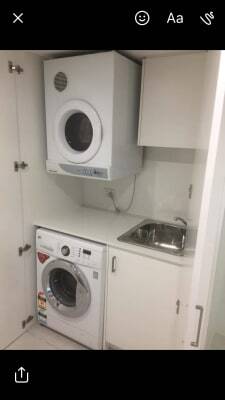 Laundry has new front load washing machine and clothes dryer. 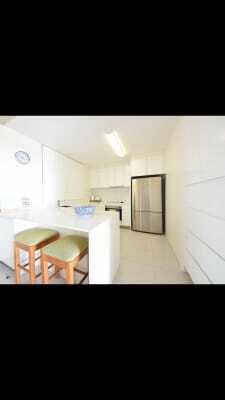 Modern kitchen with new fridge, dishwasher and appliances. Large balcony off the lounge room to enjoy the view. Smoking outside is fine. No smoking inside the apartment. Security building, 7th floor with lift or stairs access. Walk to James Street restaurants, bars and The Village Markets. Coles and Aldi are 3 mins drive away. Walk to the village markets and farmers markets. 5 mins drive from Miami Marketta. **Sorry, no couples or travellers. Lisa 40, Darren 41 We live a healthy lifestyle, spending most of our time at the beach, gym or trying out new places to eat. We are clean tidy and respectful of privacy and downtime. We aren’t party people but are very social and love the outdoors. Darren works FIFO, 2 weeks away and 2 weeks at home. So half the time you would be living just with Lisa.